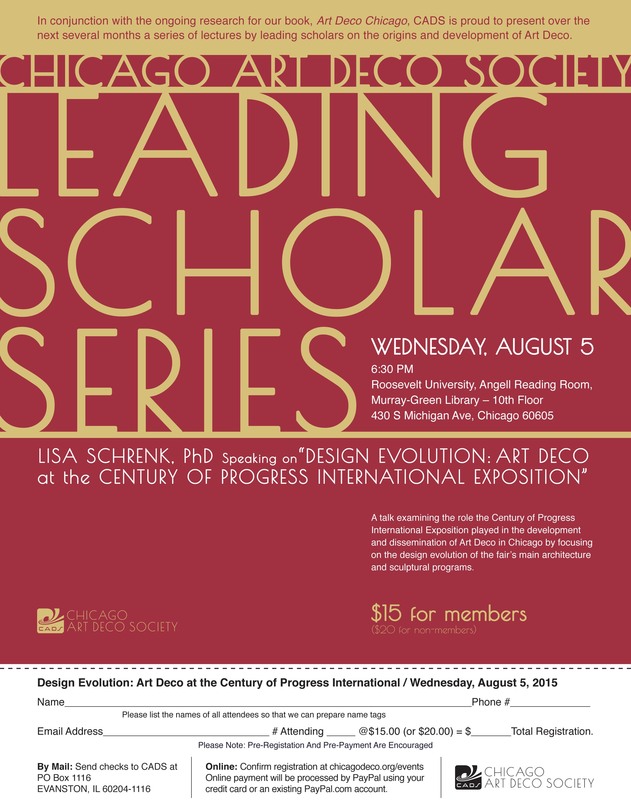 In conjunction with the ongoing research for our book ART DECO Chicago, CADS is proud to present over the next several months a series of lectures by leading scholars on the origins and development of Art Deco. A talk examining the role the Century of Progress International Exposition played in the development and dissemination of Art Deco in Chicago by focusing on the design evolution of the fair’s main architecture and sculptural programs. Lisa has had an outstanding academic career. She is Associate Professor of Architectural History at the University of Arizona. She received a B.A. from Macalester College with degrees in studio art and geography, a Master’s Degree in Architectural History from the University of Virginia, and a Ph.D. in Art History from the University of Texas at Austin. Her book Building a Century of Progress: The Architecture of Chicago’s 1933-34 World’s Fair (University of Minnesota Press, 2007) was named to Choice Review’s 2008 List of Outstanding Academic Titles. In 2008 she was awarded a We the People grant from the National Endowment for the Humanities for her research on the Oak Park studio of architect Frank Lloyd Wright, which she began while serving as Education Director for the Frank Lloyd Wright Home and Studio Foundation. Dr. Schrenk is a leading authority on the architecture of international expositions and the early work of Frank Lloyd Wright. She was a consultant and gave the opening lecture for the recent exhibit Designing Tomorrow: America’s World’s Fairs of the 1930s at the National Building Museum.